Do you ever wonder why that song – My Favorite Things (of Sound of Music fame) – makes it into the Christmas music line-up every year? It wafts through the air in shops and on radio stations, nestled cozily between Jingle Bells and Sleigh Ride. Is it just the mention of brown paper packages wrapped up in string? Surely it’s not the dog biting or the bee stinging that gives it rank among Christmas favorites. Perhaps it’s those snowflakes that stay on my nose and eyelashes? Or the silver-white winters that melt into springs? If they’re melting into spring, why isn’t it an Easter song? After all, there’s that mention of girls in white dresses with blue satin sashes, which sounds much more like a spring wardrobe than a winter one! This is something that baffles me. 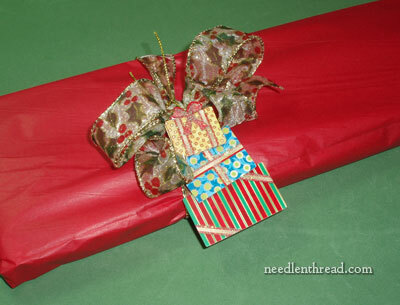 I’ve been wrapping up packages – red and green paper packages – for you! 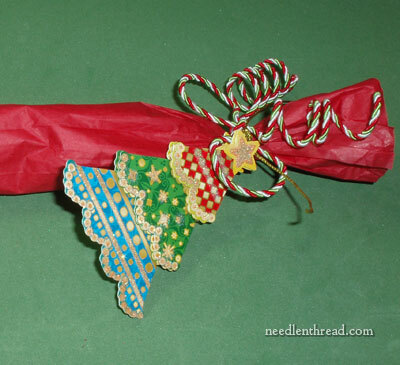 On Monday, December 26th, the 12 Days of Christmas Needlework Give-Away Series begins here on Needle ‘n Thread! In this series of give-aways over 12 days, you will find some Favorite Things – and they all have to do with needlework. They won’t necessarily all be wrapped up, since some packages will be shipped straight from the designer, publisher, retailer, or manufacturer. 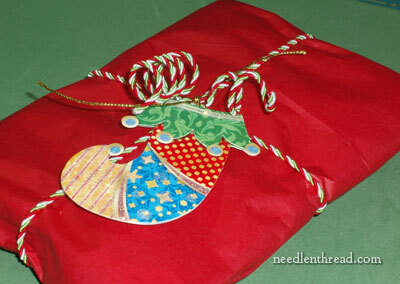 With or without the wrapping, they are all delightful needlework goodies that you’re sure to love. The 12 Days of Christmas series will run from December 26th through January 6th. All the give-aways will remain open until January 9th, on which day the winners will be drawn and announced. Each give-away comes with specific (easy) instructions about leaving a comment to be included, so please make sure you read each give-away post thoroughly, so you don’t miss out. Tomorrow, I’ll pop in to wish you and yours a Happy Christmas – and then we’ll start all the fun on Monday! See you then! January 5, 2012 Eleventh Day of Christmas: Millenium Frame! I am looking forward to 12 days of fun! Merry Christmas eve Mary. I pray that you will have a blessed, holy day. My family and I are looking forward to celebrating the Christmas season with you. Thank you for all the work you do, wishing you and your family HAPPY HOLIDAYS! Oh what fun! And Merry Christmas to you too Mary!! What great fun! And have a Merry Christmas, Mary. Sounds like fun! I just want to add that I enjoy reading your article every morning. Have a Merry Christmas! Merry Christmas! My dd and I enjoy your blog so very much! Merry Christmas, generous lady! Hope you have a very nice holiday! Merry Christmas! And thank you so much for the generous way you share your knowledge and experience. I look forward to my “class” every day. Merry Christmas, Mary and thanks a lot for your time. Hope you have a very happy Christmas – you and your family. have a wonderful Christmas day tomorrow. may i congratulate you in doing it “right”. what we have been going through has been advent. i find in most churches come december they start singing Christmas carols. the hymnals are full of beautiful advent hymns that are rarely sung. then the day after Christmas it’s over when really Christmastide has just begun, or the 12 days of Christmas. the time that the church used to use before the wise men showed up at the crech’. so many childre believe these days that the wise men showed up at the stable. when actually Jesus was probably at least 2 years old before they came. mary i know you know all of this, but i wanted to pass it on to those who might not. have a wonderful evening my friend. The merriest of wishes for a wonderful, blessed Christmas and Happy New Year to you and your family. Thank you for the blessings of friendship and generosity you bring to our lives. Thanks for all your articles every morning Mary! Wishing you and your family a blessed Christmas. Whoo hoo! Exciting! I enjoy all your posts they are each a special gift. Merry Christmas to you! Thank you so much for all you give us – ideas, tips, explanations, comparisons, and most of all – inspiration. Merry Christmas and Happy New Year. Janet. You have made the past year a lot more fun! Thank you so much! And it looks like we’ll start the year similarly!!! Thank you again! You’re The Best! Merry Christmas Mary! Thank you for all the blessings of patterns, articles on notions and threads, ‘trips’ to museums, tips that make confusing things clear and new things a joy, and all the lovely post you make on Needle n’ Thread. Wishing you and yours a wonderful Christmas day. Thank you for your web site, it is so informative – I read it every morning over breakfast while my husband reads the paper! My reading is much more inspiring than his! Interesting about “My Favourite Things”. I’ve never once heard it played or sung for Christmas here in Oz. The weather is kind to us in the Hunter Valley this season. Only 28ºC today. Although 35º further west in NSW, that’s still nice for usual Christmas weather, and it’s supposed to drop to 29º for Boxing Day. People generally have been saying that it doesn’t feel like Christmas with it being cooler but it sure suits me! Hope whatever the weather in your part of the woods, that you’re having a perfectly special time. You deserve it. Looking forward with delight to the 12 days of Christmas with one and all. Thank you. The anticipation makes me feel like a kid again! Merry christmas. Thanks for a wonderful site and i am looking forward for the 12 days of christmas tomorrow. Well, my Country Bumpkin copy of ‘Home Sweet Home’ came on Friday…so, right now, I’m all wrapped up for presents! Thanks so much for your splendid review! I am a beginner at needlework and have found your site very informative.Thanks. Your mention of brown wrapping paper reminded me of the many times I have used it for Christmas with beautiful embellishments and ribbons. Your site, when I am home, is the one thing I do not miss when I turn on my computer. Have been gone for the holidays and did not get on to their computers. Blessings to you for all of the wonderful gifts you send to us each day. Merry Christmas and Happy New Year! Thank you for a wonderful site! And yes, I do wonder why it’s considered a Christmas song. Funny. Why didn’t I catch that? I wonder if I used “wrapped” on purpose. I think I might have. I’m pretty good at quoting songs! That was a really fun series of give-aways. I might do it again next year! Previous Previous post: Other Thimble Explorations! Next Next post: A Happy Christmas to All!